It’s a well-known fact that the Hispanic population is growing at a rapid pace, and among the areas seeing the most interest and growth is business. According to the Small Business Administration (SBA), there are more than 3 million Hispanic-owned businesses in the U.S. today, a number that is growing at three times the national average. Latino purchasing power is expected to top $1.5 trillion by next year, which means that if the Hispanic market were its own country—it would be the world’s 11th largest economy. Responding to these numbers and to increasing demands for resources, the SBA launched an online course in English and Spanish to introduce young entrepreneurs to the basics of creating and financing a successful business. The SBA then partnered up with USAGov en Español (formerly known as GobiernoUSA.gov) to help get the word out. Taking advantage of a growing audience on YouTube, and to expand engagement on USAGov en Español’s Google+ community, a Google Hangout seemed to be a good place to start. 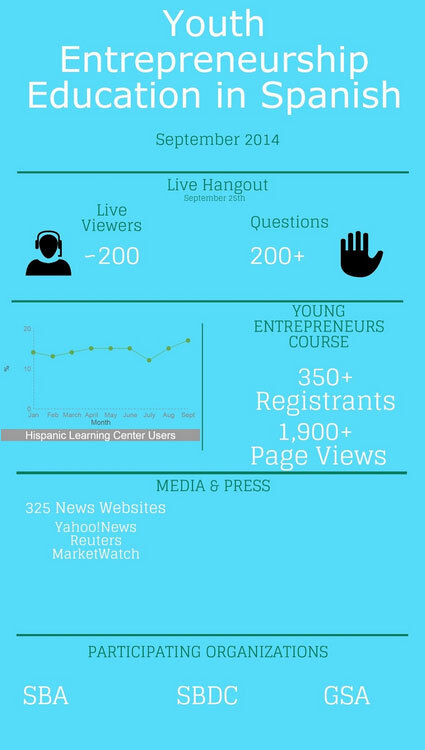 The hangout, moderated by USAGov en Español manager Laura Godfrey, included SBA loan experts and a guest appearance from entrepreneur and renowned social media maven, Elianne Ramos. The goal of the hangout was to answer questions in real time, and to provide 30 minutes of quick tips and trustworthy insight for starting your own business (in Spanish). Small business development, in all its variegated forms, industries and locations, is not a one-size-fits-all narrative. Nor is it explained in 140 characters on Twitter or even a few Facebook or blog posts. Nevertheless, the aim these efforts is to humanize the conversation early and effectively, in a format that is accessible to any Latino entrepreneur. Furthermore, acknowledging a potential appeal to English-dominant Hispanics who might want to share this information, USAGov also pitched in and promoted the course and Hangout via its various social media channels. Traffic and engagement to USAGov en Español’s Google+ page: 80% views on posts, 1000% engagement and 88 new followers. There are over 1,500 views to the video, without extensive promotional efforts. 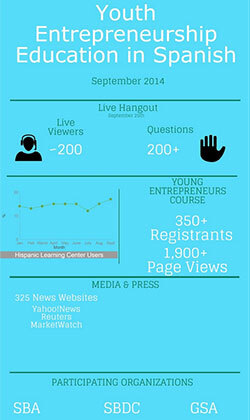 Tons of questions answered in real time for Spanish-speaking entrepreneurs who may not know where to begin. Much needed content for the Spanish-speaking community. Content that can be re-purposed and disseminated to reach an even larger Spanish-speaking audience. Preparation is key, there is a lot of pre-event work to launch a successful Google Hangout so run-throughs and starting the broadcast a little early is recommended. Clarifying roles and responsibilities with partner agency so there is a consistent message and clear user experience on how to participate in a Google Hangout. Bringing multilingual experts early into the conversation is essential. YouTube is not accessible, but adding captions and a transcript makes a video more accessible to a wider public. Tech tests—a given, making sure everyone on the Hangout can access the Hangout from their devices. As one of the first federal agencies to have a Google+ presence in Spanish, we had embarked into uncharted territory. The outcome, however, went to show that taking small risks can render big rewards. Great content deserves to live many lives. The video is being shared by the agencies, has been re-purposed into a blog post on how to start a business with the help of the government, syndicated to media and sent via email blast to thousands of subscribers. The topic will serve as an evergreen resource that will continued to be shared many times over via our various social media channels and content marketing strategies. Victoria Wales is a Bilingual Web Content Manager and supports USAGov and USAGov en Español at the U.S. General Services Administration (GSA).